The foldable Kettler rowing machine Stroker is optimal to start regular rowing training. The resistance of the magnetic brake system can be varied in 8 levels and offers challenges even for experienced athletes. 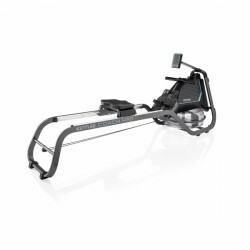 The Kettler rowing machine Stroker is equipped with a balance mass of 4 kg, providing a comfortable concentric run. The delivery includes a chest strap for measuring your heart rate. The pulse as well as information about time, strokes, etc. are clearly indicated on the display of the Kettler rowing machine. The Kettler rowing machine with special outboard machanics. The Kettler rowing machine Coach S inspires by with optimized ergonomics and innovative Smartphone control. The Advanced Brake Mode (ABM) provides an authentic rowing experience like on water. 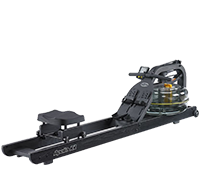 Its precious equipment makes this high-quality rowing ergometer an effective training machine and piece of design as well. 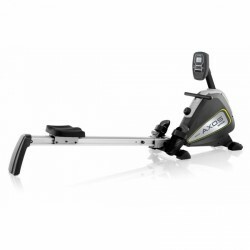 Improve your cardio and general fitness with the Kettler rowing machine Axos Rower. Do an effective whole body training and benefit from 8 manually adjustable resistance levels. It's quite easy to fold by means of the folding mechanism. This latest model improves on its predecessor with a pulse monitor! The Kettler Rowing Machine Coach 10 with its quiet but powerful, up to 600 Watt, induction brake system is the strongest adjustable rowing machine from the new Kettler rowing machine series. The touch display makes for easy usage without large interruptions to your training. With the Kettler rowing machine Coach H2O, Kettler presents its first rowing machine with water resistance. The water tank is elegantly placed between the 2 aluminium rails of the frame. The more powerful your stroke, the higher the resistance. The product is excellent! I am very satisfied of it! Excellent! I highly recommend it to everyone. Super hydrolic rower. Very solid and sturdy unlike most other offerings in the market. I weigh around 95 kg and this is perfect for me. Easy to use and give a great overall body workout. For many years, rowing belongs to one of the most popular cardio training and activates most of the muscles in the body simultaneously. With a Kettler rowing machine you can complete effective total body workouts in the comfort of your own home. Depending on which model, your Kettler rowing machine is built with different programs, pulse readings and other useful functions. The training computer keeps you up-to-date over all your important workout data, so that you can better plan your rowing training. Kettler rowing machines with a manually adjustable magnet brake system is adjustable by hand so that the resistance and intensity of the training is easily regulated. Kettler rowing machines with an induction brake system is automatically adjusted depending on which program is chosen and provides an optimal base for intensive workouts. Both brake systems are very quiet. Kettler rowing machines are equipped with a practical folding mechanism: so that after each training the machine can easily and be space savingly stored away. With the new developed Coach series Kettler expands its appealing range of rowing machines for ambitioned total body workouts at home. The innovative rowing machines were developed together with professional rowers and offer the highest quality, appealing design and comprehensive training possiblilties. The high-grade Duo Rail aluminium frame produces an especially fluid and authentic rowing movement. The rowing machines are also suited to taller users thanks to the two longer slide rails. The ergonomic rowing grip, comfortable high seat position, tighter foot position and adjustable foot pads highlights the ergonomic concept and pronounced comfort while training. The Coach H2O is the first Kettler rowing machine with water resistance. The training intensity is decided by a combination of how fulll the water tank is and through the power of your pull while rowing - for an authentic rowing feelling just like being on water. All rowing machines from the new Kettler Coach series are equipped with a large, intuitively designed display with Bluetooth connection and integrated programs for various training levels. 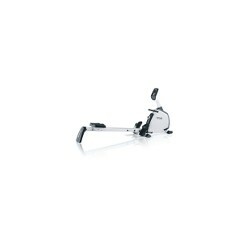 The slim, minimalistic Dynamic Loop design makes the rowing machine a catching eye piece in any room. The Coach rowing machines are developed with saving space in mind: after each workout it can just be stood up and stored out of the way. Nearly all Kettler rowing machines are built with a cable system that means that you pull with both hands on one rowing grips. This guided movement is even and balanced and is a good advantage for beginners. The resistance is controlled through either a magnetic brake system or an induction brake system. Those systems together with Kettler rowing machines with a cable system can offer high resistances - perfect for ambitioned rowers. Kettle rowing machines with cable system are therefore recommended for users at all training levels. 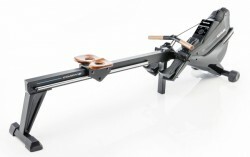 Kettler rowing machines with cantilevel systems have two separate left and right hand grips (e.g. the Kettler Kadett). Therefore the co-ordination of the row is harder. With this system the resistance with produced from hydraulic cyclinders, that aren't able to produce as much resistance as compared to magnet or induction brake systems. Ketter rowing machine - Quality from a traditional German company. The company has produced fitness equipment for more than 60 years. 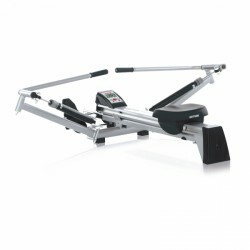 By buying a Kettler rowing machine, you get a very high-quality machine, which are best suited for daily use. 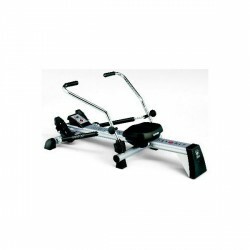 Kettler rowing machiens are marked by their durable workmanship and modern technologies. Kettler rowing machines like the Stroker as well almost all Coach rowing machines are assembled in Germany and carry the quality seal "Made in Germany"